Symptoms of type 2 diabetes: excessive thirst, increased urination, fatigue, blurred vision and weight loss. Watch for other subtle signs: Dark, velvety patches on the back of the neck and elbows, improvement or worsening of vision, itchiness and dryness of the skin, hearing loss and snoring. 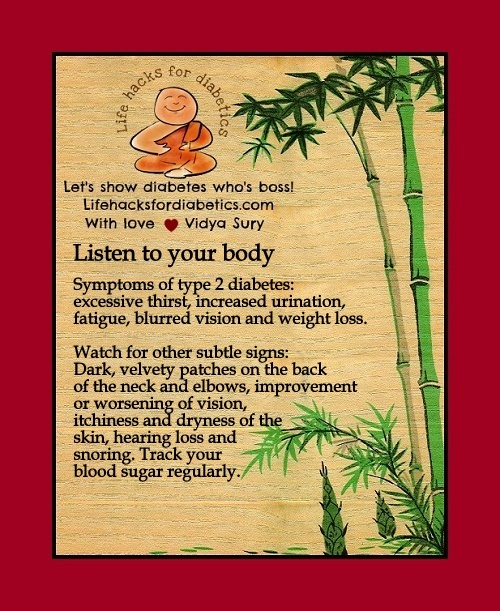 Track your blood sugar regularly. I’m at that time of life where diabetes is a possibility, so I thank you for all your tips. Have a lovely day. Yes. I’m learning to listen to my body, so I’ll be attuned to it more..